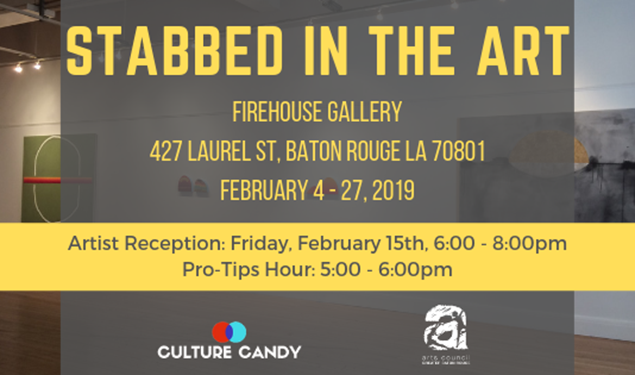 The Arts Council of Greater Baton Rouge has partnered with Culture Candy to showcase a month long “Stabbed in the Art” Exhibition. The purpose of this exhibition is to further the experience of the exhibiting artists to demonstrate how to prepare, hang, & document for a longer exhibition as an individual artist. Participating artists will be invited to the Pro-Tips session before the reception at the Arts Council, which will serve as professional development for the artists & explain all the resources available to them via the Arts Council.